Meet Dr. Haiyan Li. As a physical chemist, she develops products by mixing ingredients in the lab. Her role as a formulation scientist is to formulate products, and Dr. Li is an expert at creating and maintaining all of PURE’s formulas. Not only does she formulate new products, she reformulates current products as needed and stays up-to-date on the latest trends and published research. She also works with vendors to ensure the accuracy, purity and safety of raw materials. Every morning, Dr. Li can be found in PURE’s in-house Research & Development laboratory creating products, organizing and working with vendors to ensure they can duplicate the formulas. She meets weekly with material suppliers who share new information about raw materials trends, research and clinical studies. She also spends time reading journals and websites to stay up-to-date on the latest trends. Dr. Li collaborates daily with Darin Blackhurst, Director of Research and Development & Quality. Darin works closely with members of the Wellness Advisory Board. After meeting with Darin, Dr. Li drafts a preliminary formula with key ingredients to ensure the viability of the product. She adds different flavor agents to ensure the finished product mixes well and tastes great. Dr. Li appreciates our Independent Business Owners for their support and love of the products she creates. They encourage her to work hard and create more. She is currently working on some new ideas, but wouldn’t share her secrets … not yet, at least. She looks forward to surprising our IBOs with new products that will help everyone maximize their overall well-being. 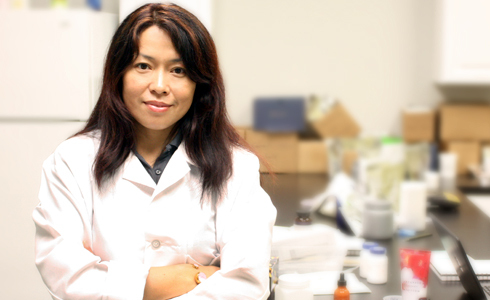 Dr. Haiyan Li has a Ph.D. in Chemistry from University of Maine. She lives in Frisco, Texas with her two daughters and husband. She enjoys traveling and watching her children play volleyball. Thanks for all you are doing Do you plan to make a lemon lime energy any time soon? i had that several years ago. Just wondering…Thanks again Julie in KS.